Home > Resources > Definitions > What is Pay per Click Advertising (PPC)? So What is Pay per Click? Pay-per- Click advertising or 'PPC' is a type of internet advertising often referred to as Search Engine Marketing in which an advertiser pays a publisher when an advert or piece of content is clicked (or simply shown). PPC is most commonly known due to it's use by major search engines, in the form of Google Ads and Bing Ads and more recently by social media platforms such as Facebook with it's Business Ads. "PPC Advertising Plays an Important Role in Your Online Marketing Strategy"
Advertisers effectively pay the platform in show their ad over and above other content, typically organic search results or when their targeting criteria have been met. These criteria are a combination of dozens of settings such as keywords used in the search, In PPC, the advertiser is only charged should the ad displayed is actually clicked. In this way PPC represents a really attractive way of bringing highly targeted traffic to your site. What Types of Ads can you run in PPC? The most common types of PPC adverts are those offered by Google, these being Search ads, Display ads, Remarketing ads, Shopping ads & Video ads. Search Ads were the earliest and still the most common type of ads in PPC are those for Search. Synonymous with Google but also present in Bing/Yahoo and various social media platforms they are perhaps the most familiar to people. When you 'Google' something for example these ads that appear above and below the organic results and are identifiable by a small ‘Ad’ logo. In this example in Google Search using the search term 'buy symply dog food online' the top 4 search results are all Search Ads. In fact the first non-paid or organic search result is only just visible on the page! All of the ads in the above example have been designed, built by advertisers using Google's Ad service for Search. Search ads allow you to target very specific keywords that are relevant to the products or services your business offers at the point a user is looking for such a product or service. Display Ads or 'Banner Ads' are a slightly different animal. They are typically highly visual and utilise rich imagery and some animation so as to catch our eye when they appear on web pages. In this example website you can see 4 Google Display Ads somewhat dominating the homepage with 3 adverts for Sky & 1 for LinkedIn. Used wisely Display Ads can form a powerful part of your PPC strategy particularly in the top part of your sales funnel. Shopping Ads by Google (*other platforms are available!) allows eCommerce site owners to advertise their products directly in search results. Using our same search term of 'buy symply dog food online' you can see a number of ads returned and the little opportunity for advertisers to differentiate their ads from the competition. These ads are keyword driven, much like search but shopping ads require a merchant centre and regular update of your store inventory (assuming physical products) in order to accurately surface your ads only when you actually have the products available. Tip: If your're unsure where to start with PPC then Search campaigns targeting keywords relevant to your core products or services are a good first step. PPC can be highly effective, with well setup and maintained campaigns delivery astonishing return-on-investment or ad spend. 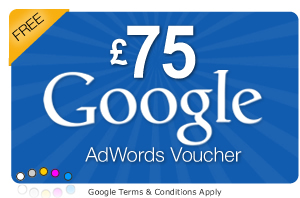 Ideally any PPC campaigns are undertaken as part of a defined digital marketing strategy. Competition to grab our attention and deliver a marketing message online is fierce so the idea of quickly delivering a message to a target user or consumer of your services is very appealing right? But that competition also brings with it a cost so to be effective and see a positive return on investment campaigns must be highly targeted, actively maintained and tracked with meaningful website analytics. Assuming you follow the path you can have ads up and running in just few hours and traffic soon after. PPC platforms want you to advertise on them and hence spend your budget with them. To that end they typically provide plenty of rich data around the audience who click your ads or content such as location, age, gender, interests and other online behaviour information. This data can be incredibly valuable to you the advertiser to inform your segmentation, campaign targeting, and website optimisation efforts. 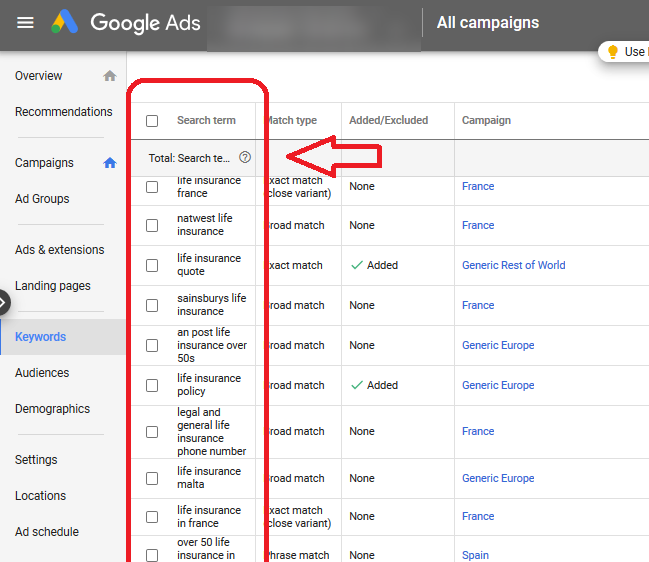 In this example for a search campaign for life insurance you can see that Google provides the search term used by the searcher to find (and click on!) the ads. One of the key elements of PPC is the ability to turn on and off campaigns quickly and easily. Contrast this SEO campaigns where you can be looking at many weeks or months of effort before seeing any tangible increase in traffic then it's no wonder this is an attractive benefit. The initial setup costs associated with the research, planning and configuration of your campaigns. Using Google Ads as an example a simple Search campaign for a single product or service would technically not take more than a couple of hours to setup, in terms of button clicking. This assumes the necessary planning and keyword research has been done and the setup is performed by someone experienced in the Google Ads. Once you're up and running you'll have a spend associated with the clicks you pay for. This can be anything from a couple of hundred pounds (or even less!) up to several thousand, depending on your business and objectives. This is the cost that goes directly to advertising platform such as Google Ads. You should have a monthly budget in mind when planning your PPC campaigns and make sure you put measures and controls in place to make sure stay within your budget. It varies, greatly! The language of PPC advertising cost is typically cost-per-click or 'CPC'. CPCs vary greatly depending on keyword and industry sector and can be anything from around a pound for a keyword without much competition increasing anything up to £30 (plus!) per click for the most sought-after keywords in the most competitive industries (see average CPC per industry article from Search Engine Journal). The term 'pay-per-click' can also be a bit confusing as PPC advertising has other types of payment models such as cost-per-mile or 'CPM' where an advertiser effectively pays based on the display of their ad 1000 times and cost-per-acquisition or 'CPA' allowing advertisers to set a target cost of acquiring a new customer and incorporate that into their bidding strategy. These are the costs associated with the resource who actively manages your PPC campaigns, be that a member of your internal team, freelancer or an outsourced external company. Most small business don't have the resource to dedicate someone to running PPC campaigns across a number of advertising platforms and choose to outsource the activity to a specialist PPC service provider. Here are a few things to consider if you're thinking of going further with PPC. As we've seen PPC has a number of benefits and done right can bring tremendous results. However, it's use should form part of a wider digital marketing plan, ideally one with an overarching campaign strategy that clearly maps to and supports your business objectives. PPC should never be considered a silver bullet solution to traffic generation and should be used to work alongside and complement other marketing initiatives such as SEO, referrals, inbound content marketing etc. We advise regularly reviewing your web analytics (we recommend Google Analytics) to make sure you have a healthy balance across campaigns and channels. Whilst the targeting, optimisation and automation capabilities of platforms like Google Ads are incredibly powerful PPC campaigns should never simply be setup and left. Doing so for any period of time will likely see your budget evaporate quicker that you planned and probably on traffic that wasn't relevant or not ready to convert. Final Thoughts on Getting Started with PPC. Powerful? Yes, Cost Effective? Yes, Easy? Nope! Success in PPC is often grounded in the research and planning and preparation phases. Key tasks such as analysing and describing your target customers, defining segments and mapping customer journeys through your website. These are all important pieces of work that will help shape the structure of any future PPC campaigns you setup, no matter which platform[s] you use. What's the Difference between Google Ads & AdWords Express? What types of adverts can you run on PPC? What to watch out for in PPC?